The Secret Life of Pets movie quotes tell the story of what pets do after their humans leave for the day. The animated comedy was written by Brian Lynch, Cinco Paul and Ken Daurio and directed by Chris Renaud and Yarrow Cheney. Produced by Illumination Entertainment, The Secret Life of Pets opened in theaters on July 8, 2016. In The Secret Life of Pets, Jack Russell Max (voiced by Louis C.K.) is the happiest little dog in his one-dog home with human Katie (voiced by Ellie Kemper). He spends his days waiting patiently for her by the door and chatting with fellow pet friends, including Pomeranian Gidget (voiced by Jenny Slate), pug Mel (voiced by Bobby Moynihan), dachshund Buddy (voiced by Hannibal Burress) and cat Chloe (voiced by Lake Bell). But when Katie brings home another dog, Duke (voiced by Eric Stonestreet), things go bad. Max and Duke fight to be Katie's top dog and end up getting picked up by animal control in the process. They're rescued, by cult leader bunny Snowball (voiced by Kevin Hart), but Max and Duke faced with the seemingly impossible task of working together to escaping the cult and finding their way back home in the busy and spacious New York City. 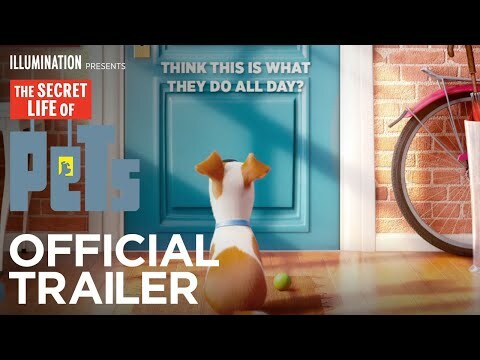 The Secret Life of Pets joined theaters already showing other great summer 2016 films such as Swiss Army Man, Finding Dory, Central Intelligence and Genius. Katie: Max, I'll see you tonight. Max: Oh, I miss her so much! ... She's back! Katie: I forgot my phone. Max: Ugh. I miss her so much. When Katie leaves Max for the day, Max has only one thing on his mind. He misses his human and will wait patiently for her to return. Max: Yes, big, big stuff today, Gidget. I got big plans. I'm gonna sit here and I'm gonna wait for Katie to come back. Gidget and Max discuss the big plans they have for their days while their humans go to work. Max is focused on waiting by the door for Katie while a nap in the sun seems like Gidget's priority. Gidget: Where... is... Max?! Tell me! Gidget: Don't look at him! Look at me! Looking for Max, Gidget interrogates hairless cat Ozone on a rooftop. Ozone is a bit frightened by the situation, especially as the bird up there watching the whole thing isn't coming to his rescue. Gidget: Hi Max, who's your new roommate? Max: He's going to be gone soon! Gidget notices that Max has a new friend, his new roommate Duke. Max is far from happy about this development and assures Gidget that Duke is not going to be staying long.